i have no intro to this "i'm sharing what worked for us and it might not be what works for you and that's okay" post, except i'm sharing what worked for us and it might not be what works for you and that's okay. my mantra for motherhood is that each mama knows their babies best. it seems like like there is always an IT question that you get all the time at certain stages in life. when i got engaged at 19 it was the raised eyebrows and you are getting married so young, why? after marriage is when is the first baby coming? and then more raised eyebrows when baby number two is concieved only ten months after baby number one is born. now our questions are adopting and pregnant?! your kids go to bed at 7:00? what in the world?!? who's kids go to bed that early? how did you get your kids to go to bed that early? how do you do anything after they go to bed? why? and so and so forth. let's go back to the dreadful days of survival with a newborn. sorry, for using the word dreadful and newborn in the same sentence but it's true y'all. i actually just started twitching and breaking out in hives while thinking about the lack of sleep and raging hormones that will hit me in winter of 2012.
anywho. i babywised my babies. mothers everywhere shake their heads in disgust. i did it, loved it, and i am living to talk the glories of it all. i will do it with every future child, too. when i say i babywised my babies i mean that i kept them on an eat, wake, sleep schedule from the earliest time possible. that is the premise of the book, teaching your babies to fall asleep on their own. the book talks about a lot of other things but that is really all i needed to take from it. with brody we started it around a month old, and with foster, we began at two weeks. clearly newborn babies cannot stay awake awake at such young ages, but we would carry them around, or at least keep them a little stimulated, and not let them drift off into a deep sleep for their wake period and then lay them down awake. and it's all based off of that. they never needed something like nursing, or rocking, or co-sleeping to fall asleep. which means mom and dad sleep. which in my case, means i parent well. rather then not parenting at all when sleep deprived. did i sometimes nurse or rock a crying baby to sleep? of course. was there a week straight when foster was 3 weeks old when he wouldn't fall asleep anywhere but laying on me? you betcha. but, for the majority of every day, i fed them, had some wake up, then laid them down to sleep for nap or bedtime on their own. and it shaped how they sleep to this day. neither of my boys ever had to cry it out for long. they might fuss a little bit but because they knew nothing else but falling asleep when they were put in their bed…they fell asleep. and they still fall asleep. so now, at 21 months and 3.5 years, we put our kids to bed around the same time each night and make sacrifices to be home at nap and in time for bed. are we home more than some people with little kids? surely. but my kids are well rested which makes them happy. which makes me happy. can you sort of see the cycle forming? also, can you tell i am getting ready to break out the book again to refresh myself? me: brody, this is your new big boy bed! me: you know how you never got out of your crib EVER? me: well if you ever get out of your big boy bed it is going back to to store. me: do you understand me? no getting out, bud. the child hasn't put a toe on the floor until we go in the morning and every day at "nap time" when he doesn't nap? stays in the bed, happy as a clam. bless you, sweet child. bless you. time for me to get some sleep… cause my kids are sleeping. what a fun read danielle..i do not have any babies yet but i like your routine you wrote about, my sister-in-law does the same thing and my little niece sleeps just great! p.s. you are looking adorable and super happy--grow baby grow! your boys are so sweet. i never read babywise. but we kinda used that method, i guess! it worked for us, too!! beautifully! then. 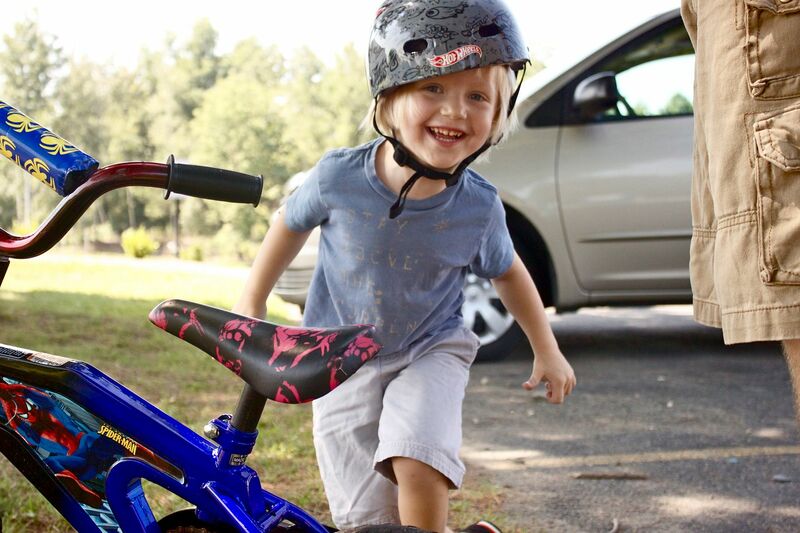 in february, at 26 months, elijah stopped. he WILL NOT sleep. whenever he does fall asleep, it isn't for very long. and if we don't jump out of bed as soon as we hear him get up, he t e a r s the house apart. anyway, i could blab on forever about this. we are visiting docs and praying because we are ALL exhausted. Babywise is amazing and all those moms that hate on it can talk to me once they wake up from their afternoon nap, due to sleep exhaustion from feeding their baby every 20 minutes. WHA! Pregnant!? (Haha!) Whoooaaaa! Awesome, crazy, both! We are adopting too, but hopefully not pregnant as my hubs has already had that taken care of, so anyway! CONGRATS on both! Oh my gosh, I love this post! amen and amen. I did the same with my boys and they go down at 7:30 almost all the time when they have school (summer I am more lenient) and it is great. my boys need their sleep and momma needs her time. And it is great because when guests are over and I don't have time to rock or even read a book, I walk them to their rooms, lay them down and that's all I have to do. Praise the Lord. Then I come out and people always ask "they're sleeping? already??" They put themselves to sleep. Best thing I ever did for my babies and for myself. Worked for us too! So funny about the big boy bed, that sounds like an easy way to go! i love that i read this at 2:00am because my daughter woke me up. A friend had lent me that book a couple of kids ago and I didn't get into it. I have some excellent sleep things about my kids and some not so good ones. I wish I would of kept with the book. And love that you kept your son in the crib so long. Yep, definitely followed (still follow) the basic principles of babywise and both our babes are great sleepers too! Oh, wait, except for my snarky little boy, who decides he still needs a bottle at 3am because he's STARVING! For real though, I really like this method and the principles behind this method and it has worked for us! wow! 14 weeks for real! you are still one hot mama. i also did babywise, and then i really really loved Healthy SLeep Habits, Happy Child. awesome book. alivia crawled out of her crib over and over and over again at 16 months old and was in a twin bed at 18 months old. bryson is 25 months old, and hasnt crawled out yet. i dont feel the need or desire to transition him. and lets see a pic of that new bed! girl you are too cute! love that little baby bump! Are you guys finding out what you are having? I read this and it was like I had written it. I got married at 19 and got those strange looks and questions, and now with adopting and being pregnant people think we're crazy. Lincoln is almost 26 months and is still in his crib. And the only reason I'm considering changing to a big boy bed is pressure from other mom's who think he's too big to still be in his crib. But really I am in no hurry because I don't think he's ready. We did babywise with him and will with this little one as well. People are always amazed that he goes to sleep so well! i used babywise and LOVED it also. people think i am weird and crazy. not nursing a newborn to sleep???? what kind of horrible mother am i anyway??? it totally worked for us and i have always had children who sleep. we are home more as well, but it means we are better rested and i will take that trade off any day! congrats on the new baby. i am not far ahead of you at 20 weeks and look like i should be delivering tomorrow! thanks so much for sharing. this was a great, honest post about what works for you. I am super lucky that my Behr is easy and sleeps well without a set schedule, but I am sure that fututre kiddos will not all be so flexible. It helps to hear what others have done and are doing. I also followed Babywise well basically just the pattern with my son. I plan on doing it this time around also. I took what I needed from that book and skipped the rest. It worked for us. My son is a great sleeper. 7-7:30 everyday. We also used the no cry sleep solution. Sure he may really love his blankets now but if those give him comfort I'm okay with that. You do what you have to do for your kids and your family - what works for one may not work for another. But I would never knock another mom for trying. Thanks for posting this. I like you & think you're awesome. I love Babywise & seriously attribute my great sleeper to the Babywise pattern. I also think it's so important that you mentioned that each parent has to decide what is best for their child & family. P.S. You rock that big baby bump! first of all you look sooooo freakin cute! second, i loved reading this post. i'm not a mommy yet, but i know i will be soon and i love soaking up all the lessons and stories... THIS is one me and my hubby have talked about already and it was good to read about. you're the best! I babywised my little girl and will do so with every child under my roof. thank you for putting that out there. now I can come out of the closet too. 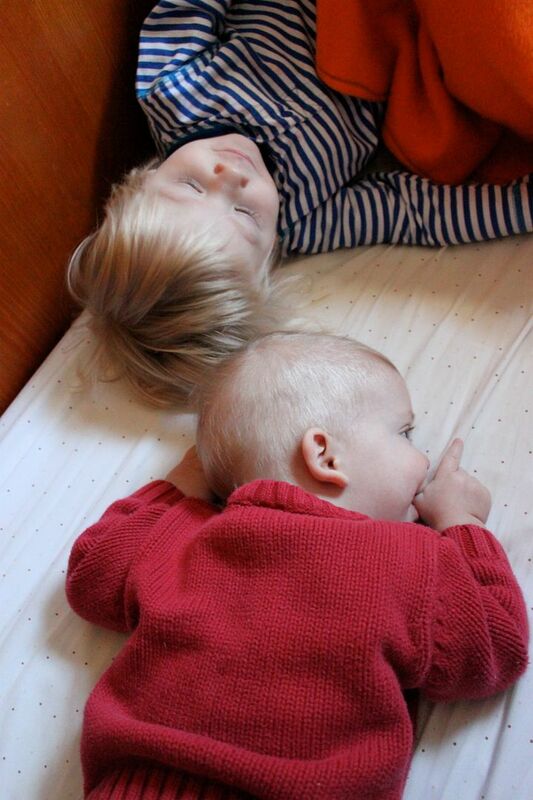 we tried the AP (attachment parenting, which supposedly makes for the best, happiest, bonded babies) with both boys. after about 3 months of non stop crying, fussing and no sleeping for anyone we read babywise, impletemented the method and instantly had happy, well rested babies. not even kidding. i'm not a pacifier, i wasn't created with a pouch, and my bed is my husband and i's. and shockingly, both of my boys still love me, nursed, are thriving and bonded. you are positively gorgeous and i'm patting your tum at blogsugar. no buts about it. i also babywised story and wilder and will claim its effectiveness til the day i die. my friend kyle (above) penned it so well--her sentence about i'm not a pacifier, wasn't created with a pouch...babywise was hard sometimes (sad to hear them cry) but oh my it paid off. people couldn't believe that i was able to get a full night's sleep when wilder was 3 mos and story about 2 mos!! heaven. love u. You are SO stinkin' cute!!!!!!!! You are adorable! I love, love love that top!! We babywised our girl and are going to do it with the next, well, mainly the eat, wake, sleep thing too. It's a life saver. Way to go beautiful momma! You do look great! I'm a big big big proponent for Babywise. I did it with both my kids and they both sleep so good. I am rested and my marriage is great! Which in the long run helps everyone. I have thought about doing a post about this, but didn't want to offend anyone who is against babywise. But I'm so glad that you did it! Maybe I will one day - b/c the sleep training and building that habit saves a lot of anxiety and stress for a mother! wow, i totally read this last night on my phone and thought, i'll leave a comment in the morning and was hoping you would get hate mail cuz a lot of my friends think babywise is crazy. but it worked for me - and i will use it for every future baby. and i'm glad you had the balls to post this. i just said balls on the www. Haha! You look fantastic by the way! Our kids (ages 5, 4, and 3) go to bed every night at 7:30. Sometimes I'm nice and let the 5-year-old stay up until 8:00, but now that homeschool has started, she will be back to her 7:30 time. I never did the Babywise thing persay - I just kind of figured it out as we went along. We have moved each kid from crib to big kid bed at age one (I know, crazy, right!) and mom and dad love their "no kids" time after 7:30. seriously. I love my kids like no one's business, but I adore that time after 7:30! (and we may have kept the kids in cribs longer, only #2 was born just 14 months after #1, and #3 was born just 16 months after #2. We needed the crib!) Now #4 is coming soon. We'll see if this one jumps into our sleeping schedule well. and sorry about the uber-long comment! always great to know what other mamas do. we started down the babywise road with ben, but i struggled with it when we ran into feeding and pooping problems. i threw in the towel - and maybe it was a little too soon. think i'll pick the book up again before baby girl arrives - maybe we'll give it another go. :) glad you shared! on that note - i've always tried to encourage a good routine, and definitely agree in being at home more to stay on a schedule. it helps everyone out! I did not adhere to a strict schedule with my first because she was super laid back. She did go to sleep on her own, in her crib, for the most part, and at 7 years old is a super sleeper. The second one was a different story, colic for 9 months, miserable sleeper for almost 2 years. He is now 5 and is a great sleeper. Remember that each child is different. The second one demanded a schedule and when we had him nap/ sleep at specific times, he flourished. They are all different and you have to figure out what works for your child and for you. I definitely agree that I am also a better parent with plenty of sleep! 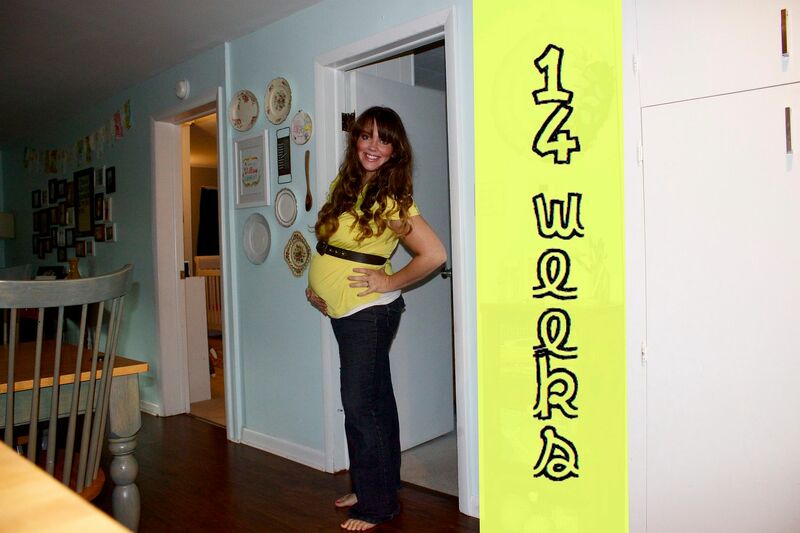 Danielle, I LOVE your 14 weeks picture!! So fun! And AMEN to Babywise! My husband (of all people) actually bought the book 7 years ago, when I was pregnant with my first, and three babies later, we still swear by it! All three of my boys were (and still are) the best sleepers. And to the commenter who posted about having company over at night, and how awesome it is to just excuse myself for like 5 minutes so I can go and change the baby, lay him down, kiss him, wait to hear his precious "Good Night Mommy", turn off the light, and close the door. It's amazing!!!! As for my 4 & 6 year old, they've been getting themselves ready and into bed, by themselves, since they were 3 years old. Bedtime routines around here are heavenly! Glad I am not the only one with a "quite a bump" at 14 weeks. I was told that with the 2nd I would show sooner, but never equated that with "big sooner".... Nice to see that I'm normal! I love your schedule for your kiddos-- We never read Babywise, but Leeland has put himself to sleep (quietly) every night at 8pm since he was about 3-4 months old. What a blessing it is too! cute, cute prego you are! i did babywise w/ Ava! I really took away the sleep schedule too! It was the best thing for us, she really started to get into a groove around 3 months, and it's been a life saver to my sanity. she's now very predictable which is so great. and i love what you said about each Momma knowing her child best. it's so true. I wish more mothers would embrace that and be more supportive of one another. on a total side note, do you have a roomie for blogsugar? i'm thinking about going but needing a roomie. My kids (8 and almost 6) still go to bed at 7:30 and I for one think it is great, but people are always a little shocked. You go mama! There are a multitude of things that make you awesome. And in awesome, I mean, you are so similar to me!!! Hahahahahaha! I totally baby wised my kids too! It's the bomb and makes having babies a blessed time instead of the hardest time, not that it's without it's problems too. But to have that predictability is so amazing! Ok... Also, I grew so fast with my third baby too. By six weeks I could already wear preggo clothes! I love your belly already bc it reminds me of mine from a couple years ago! Anyhow, thanks for being awesome! You rule! Oh yeah... And my kids go to bed at 7:30-8:00 every night... And sleep til 7:30-8:00 each morning. They are 7,5 and 2. Maddox is a self-soother. he now tells me "nigh-nigh" when he's tired & wants to go to bed (at 15 mos old)! oh, and ps...you are SERIOUSLY adorable prego ;) seriously. We are so doing baby wise as soon as our little bundle is here! Love the instruction that the big boy bed will go back to the store if he gets out. Train 'em girl! (and I mean that in the best of ways-train a child in the way he should go & when he's old he won't depart from it) awesome way to teach respect for your authority as a parent. i think all kids should go to bed at 7! HA! I love you. THIS is exactly what I try to tell parents ALL THE TIME. But since I don't have babes of my own they question me and think I'm honestly just nutzo. Bless you and your sweet babies. I LOVE babywise, we did it with both of our kids too and they go to bed at 7:30, by themselves. I LOVE it and couldn't imagine it ANY other way! I have to say tht you are such an inspiration. I have had a burden for adoption since i was 15 years old and my husband and I have discussed it many times and we definitely are planning to adopt. I am hoping that we can start that journey in the next couple of years. I also think it's wonderful that you are still going thru with it even though you are pregnant. It's exactly what I would do! So. thanks for sharing and I will be following you on this journey and hopefully be able to help support it in the near future. God bless. Thanks for sharing Danielle. I babywised too, and it was my LIFESAVER!!! I have reaped the benefits in later years, because 4 years later, I still have good sleepers (babies AND parents trained)! Both of my kids stayed in their toddler beds too. We were firm the first day, and there's never been a problem! i babywised 4 kids. fabulous! the eat, wake, sleep schedule is a god send! thanks for mentioning it here. for some reason, some folks are all weird about it. i just don't get it. just catching on on some blogs since the day this posted was the day i was a-birthin. yeah, that 14 week bump is something else! that shot looks like the 70's somehow, and i like. ALSO, encouraged by Brody's transition to bed, because I plan to follow in thy footsteps. taking it slow, keeping them little...i am with you. I wish we had done this with our first daughter. We learned from our mistakes and put baby #2 on a schedule and she is an AMAZING sleeper/napper. Our first daughter however takes FOREVER to put and stay in bed and barely ever naps.